So, what’s new? Well the first thing up is the updated application UI. The goal for the updated ui was to continue showing off the skin-ability of AIR applications and also help streamline user interactions. kuler continues to leverage the transparency effects of AIR and now has a beautiful cutout UI that highlights the kuler logo and application buttons. Some of the other UI additions are unification of the kuler web application loading animation with the loading animation within kuler Desktop and making the Sign In / Active Internet connection light more prominent at the bottom of the tool. Another important change is the addition of the grip bar and hand icon over the Themes. One of the coolest features in kuler Desktop is the ability for a user to grab a Theme and tear it off into its own window. This is one of the “wow” features because every time someone sees it for the first time they instantly go “WOW!”, me being one of them. This functionality is actually not a new feature, it was in the original release of kuler Desktop. Unfortunately it was not as easily discoverable as was hoped and this new UI update is intended to help people discover it quickly. The drop-down menu now has two new options for users. The first is the About menu. In the previous release the general about details were located in different locations within the info panel and this information is now consolidated into a single location. The other new menu option is shown when a user signs into their kuler account using an Adobe ID. The previous version of kuler Desktop allowed users to view the Themes they created in the kuler web application but they could not view any of the Themes that were marked as favorites. Now user can view any Themes that they have marked as a favorite on the site once they have signed into My kuler. 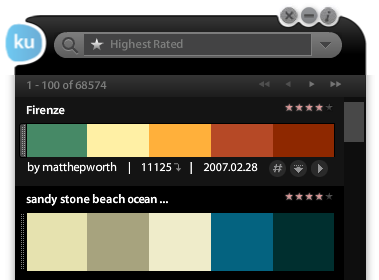 With kuler Desktop users can now view all the Themes in all the categories. One of the limitations of the original release was that they could only see the first 100 Themes in a category. No longer! The UI has a new feature that allows users to page through the themes a 100 at a time, or they can jump to the first or last 100 with a press of a button. kuler now also show users their current position in the Theme category so that they know exactly where they are. In addition to exposing this feature in the UI kuler now has added the ability to cache Theme pages so that when someone navigate back and forth through Themes they only have to load a new page when they exceeded the current cache limit. This makes extended browsing much quicker for everyone. The killer feature in this release is the ability for kuler Desktop to export Themes directly into Adobe Photoshop, Adobe Illustrator and Adobe InDesign with a single click. Not only can kuler Desktop directly import a Theme with a click kuler Desktop can also launch the CS application if it is not already running. kuler can do this thanks to an awesome new application called SwitchBoard. SwitchBoard, which is now on Adobe Labs, allows AIR applications to communicate with CS applications via an ActionScript API. Using the API developers can send ExtendScript commands directly to the CS application of their choice. 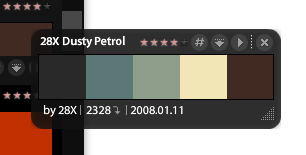 Thanks to the power of SwitchBoard users are now able to save the Theme ASE (Adobe Swatch Exchange) file to the appropriate CS folder location, call the CS application, tell the application where the ASE now lives and to have it open the ASE in the Swatch palette. On top of all that kuler now has a built in an auto-update utility leveraging AIRs update support that allows kuler to determine you when a new version is available. Adobe kuler Desktop can now call out and see if a new version is provided and if it is the application will download and auto-install the update for you. The new version also a lot of fixes for usability issues and bugs that both the QE and the kuler community have found. Overall, this is a great dot-release and I feel you all are going to love the new features! !